FIFA Mobile Soccer APK is now available for Android, so if you want to play it you can download the latest version 6.3.1. The game that was developed by EA Sports is one of the most awaited games. And now you can play it for free on Android. For those of you who may be a beginner, you can follow the existing tutorials. So that later you understand all the controls and tricks in order to win the game. At the beginning you have to fill your age, then you will get 3 options for login, logged by the device, Facebook, or play games. Then as the game in general, you must create username. In this game there are a lot of clubs from all leagues on the world which you can choose, ranging from the Premiere League, Bundesliga, etc. After selecting a club you can try the tutorial mode. The first tutorial in this game is penalty kick. To perform penalty kick, you have to swipe from the ball to where you want to shoot. After making the penalty kick, you will get bonus coins and XP. So, use that opportunity. Furthermore, we can upgrade our team by purchasing a pack. The pack contains some players that you can use in the game. You can do all the tutorials to get coins, XP and pack. Like soccer game in general, this game has virtual stick. On the left side is used for player movement. However, the virtual stick in this game is very responsive and very easy to use. 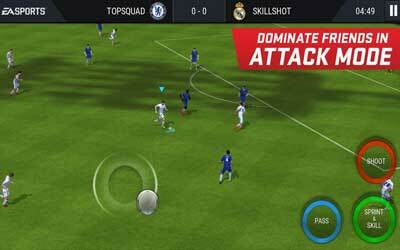 If the mobile soccer games players can run only, then in this game we can do skill moves by tapping on the skill button located on the right side of the screen. With these features the game will not be boring. In addition to sprint and skill button, there are also pass button and shoot button. Overall, this game is easy to play. The quality of graphics in this game are also quite good. Fantastic game! The new ‘Attack’ game mode is a lot of fun! Great user interface with fast and easy gameplay. There are so many tutorial mode so it is very good for beginner to learn about the gameplay.